Create a profile for yourself on the Customer list. From the profile tool bar click to open the Profile Settings. From the Discount Type drop-down options select Personal Use. Click OK to accept and close the form, then Yes to save the profile settings. When you need to take items from your inventory, just create a new invoice under the personal use profile created. On the Weekly Accomplishment Sheet the retail cost of the items will appear in the Reorder column, with the offsetting discount under the Gift Section 1. The Personal Use? column will be checked as well. When running the Gross Receipts report for tax purposes, you can choose to filter Omit Personal Use, or alternately to filter and retrieve information for Personal Use Only. 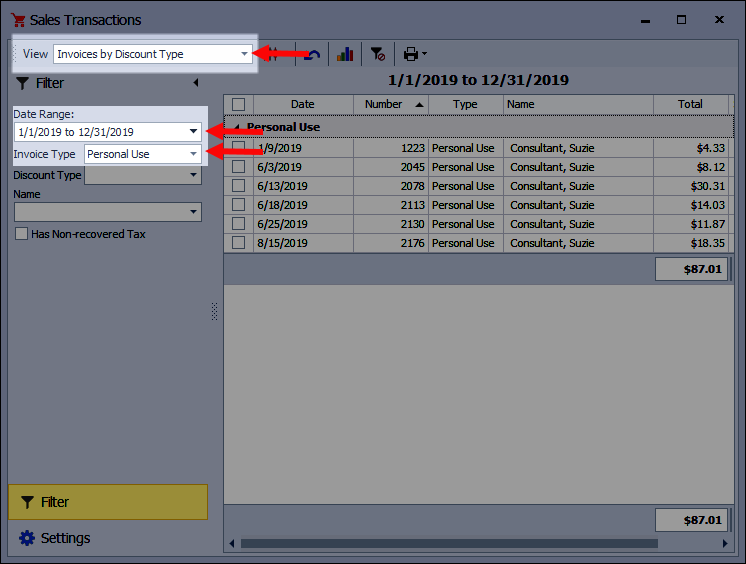 When handling personal use in this way, purchases will still appear on the Gross Receipts report and will have the offsetting discount so that your net sales are correct, while showing no profit made on the items. First, find out from your director whether to include personal use when submitting your Weekly Accomplishment Sheet. 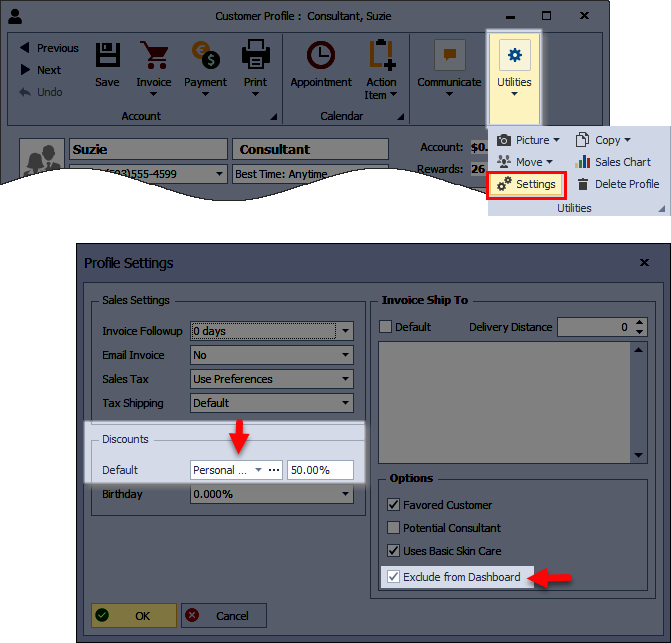 Then select the method in which to send your WAS, and choose whether or not to Include Personal Use sales in the totals. The Year-to-Date totals on the WAS will reflect the option you select. From the Shortcuts form, click My Weekly Accomplishment (or from the Business Tools menu, select My Weekly Accomplishment). 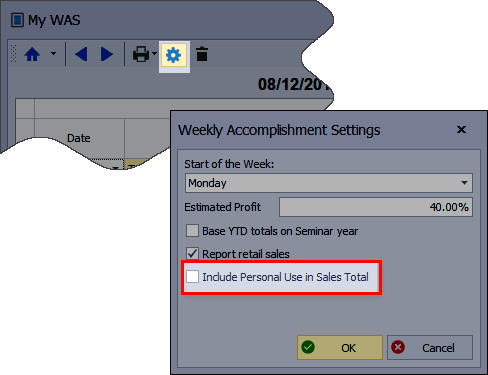 Click to open the Weekly Accomplishment Settings, then uncheck Include Personal Use in Sales Totals. By invoicing your personal use situations using the steps above, all of the transactions will be grouped together, and easily accessible under Sales Transactions. 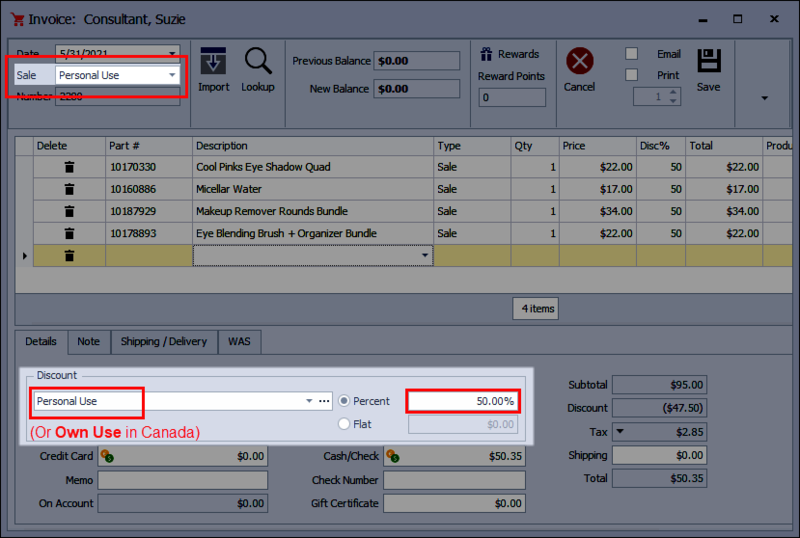 From the Shortcuts form, click on Sales Transactions, (or from the Business Tools menu, select Sales Transactions). Under the View drop-down, select Invoices by Discount Type. In the Filter side bar, select the appropriate Date Range. From the Invoice Type drop-down choose Personal Use. To print or preview, click .